This post ends our month long tribute to Hero Arts. And I’d like to tell you how much I admire this company. They are always spot on. Even if a particular design isn’t to my liking, I usually still love it, and want other people to buy it and use it. Ha! Amazing. Each and every single time you use one of their stamps, whether cling, rubber or clear, it stamps perfectly. And that is what endeared me to them in the first place. Crafting can be frustrating at times, especially for me, when I have an idea in my head and I need to figure out how to get it onto paper. So when I use a Hero Arts product, and it does exactly what it’s supposed to do? More, please! This is something near and dear to my heart. My blog used to be called “The Green Diet” and it was frequently used as a way for me to talk about things we can do to assist this earth to be around for much longer. I’ve always been an environmentalist, and always will be. And I love that I share this characteristic with Hero Arts. Please click here to read more about how Hero Arts helps the crafting world make less of an impact on this planet. I have had the honor of meeting so many people from Hero Arts. And every single one of them is genuine, and caring, and just my kind of people. And, without Hero Arts, and the crafting world’s mutual love for them, I would not have met the wonderful ladies, and now friends, from A Blog Named Hero. So, thank you Hero Arts, for all that you do for the crafting community. We wouldn’t be here without you. Now, onto my little cards. I always like to include a small card with gifts this time of year, but I don’t want it to be a standard sized card, because I just want to write a little something inside, and not have it look too bare. So, here are two four inch notecards that I will use with some holiday gifts this year. I used some washi tape to make a border on my watercolor paper. For the Joy card, I just did a simple wash of some tube watercolor. 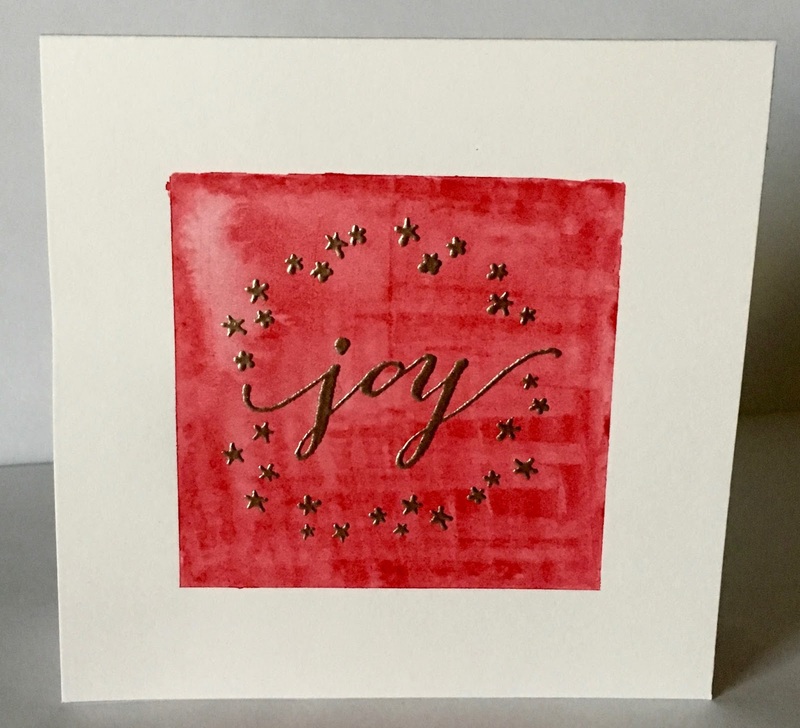 Then when it dried, I stamped and embossed the Joy stamp. 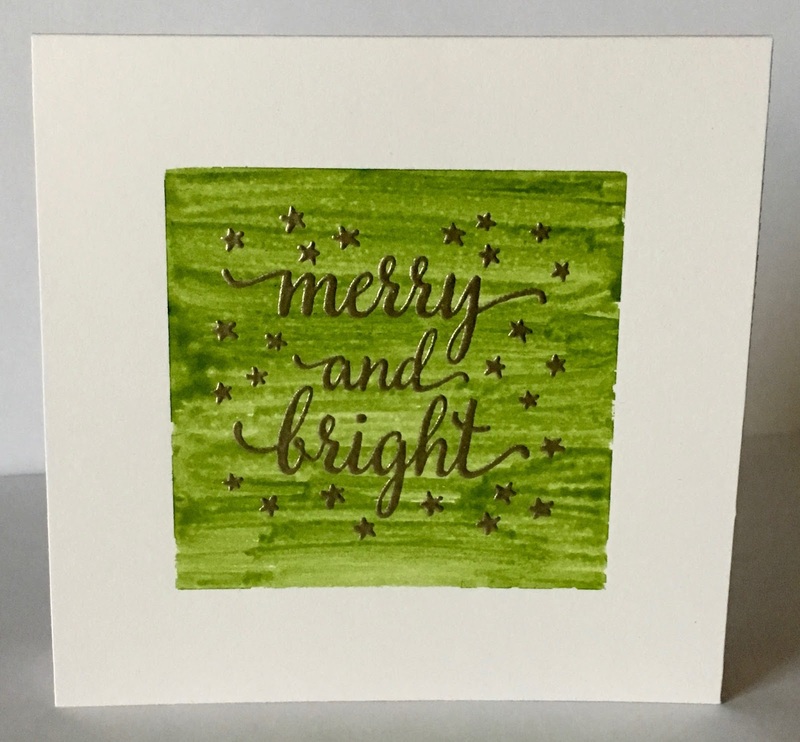 I did the same for the Merry & Bright, except I used perfect pearls when I made the watercolor wash, and it ended up streaky. Which I really liked. It must be something with the property of the green paint, since I couldn’t replicate it with another go at the red. These note cards are really cute and festive!! Thanks for sharing Lisa! Great idea to personalize your own notecards! Love Hero Arts too! And such lovely vibrant cards. These notecards are lovely and a great gift idea. Thanks for the lovely comments about Hero Arts, I have always admired them as a company, but it is nice to see and hear others views as well. There is a lot to like about Hero Arts. My favorite stamp company. Very sweet Lisa. What an awesome post with a pair of awesome cards! I love my Hero Arts stamps, and I'm so glad that many of them are available at my local crafts store. Great post and fabulous cards! Thank you for your kind tribute. Really nice words, and super nice cards! Thank you so much for your kind words, Lisa! Happiest of holidays to you! !